Rappers and musicians alike are never too fond of fans getting overly touchy with them, so I never understand why those who fall into this category continue to stage dive, but each to their own. The rapper in question this time is Jacques Webster, better known by his stage name Travis Scott. 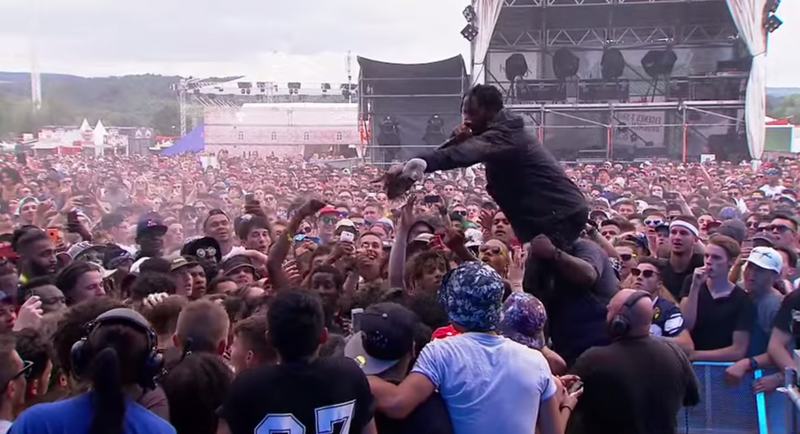 The 23-year-old from Houston, Texas, was performing at the Openair Festival in Switzerland when he decided to chuck himself into the crowd. However, it all turned sour when a fan tried to swipe his $900+ Yeezy Boost sneakers right off his feet. And of course, members of the crowd proceed to do exactly that. The would-be thief is punched, kicked, dragged over the barriers and then spat on by Travis himself before being kicked out of the concert all together. Perhaps it was all a little harsh, and someone like Travis should focus on being more of a role model in these situations than an instigator of violence. But hey, heat of the moment is a pretty dangerous thing.